The Corporate Work Study Program (CWSP) works because it provides an economical, high quality solution to meet office staffing needs. Arrupe Jesuit's innovative formula of combining work and education adds up to a unique opportunity for students and for the Denver metro business community. One full-time, entry-level office job is filled by a team of four students. 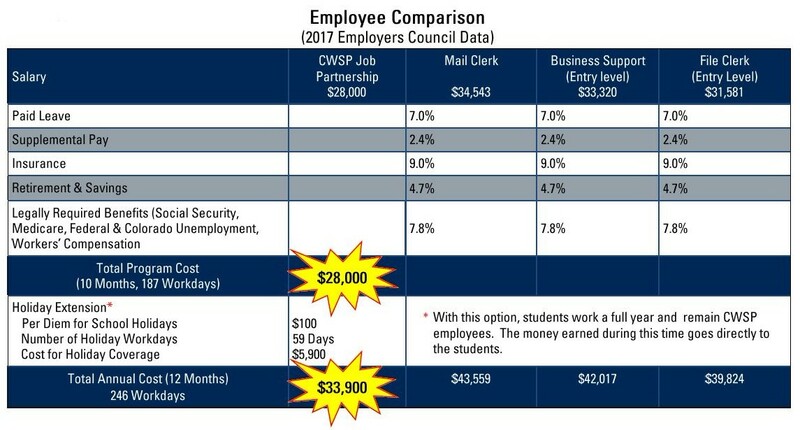 Students are CWSP employees. In addition to managing W-4's, I-9's and Workers Compensation, CWSP staff provides office skills training, transportation and customer support to hiring organizations. Cost Comparison - "It makes business sense"
High turnover positions are filled by a team of four capable, talented and motivated Arrupe Jesuit students at a fraction of the cost of recruiting and hiring a traditional entry-level employee. The four students each work approximately five days per month, sharing the responsibilities of one full-time position. Hiring organizations have a simple fee-for-service contract with the Arrupe CWSP. The cost is $28,000 for the work year, spanning approximately ten months from the middle of August to the first week in June. Organizations also have the option to hire students during school holidays and over summer vacation for a $100 per diem fee. Contracting with Arrupe Jesuit students for a full calendar year costs $ 33,900. The table below is based on the Employers Council 2017 Wage-Salary Survey. Twice each year supervisors evaluate student work performance. This feedback helps challenge students to achieve high levels of performance and ensures that CWSP provides value to the organizations that invest in Arrupe Jesuit students. In addition to providing an overall performance rating, supervisors evaluate students in several job performance areas, including punctuality, reliability, initiative, work accuracy and speed, time management, and their ability to communicate effectively. During the ten year years that Arrupe Jesuit students have participated in CWSP, over 96% have received one of the top three ratings of "Good", "Very Good", or "Outstanding"; over 35% are rated as outstanding. "I had a great time and it is easy to see why your students are so well prepared. I have been immensely impressed over the past several years with the interns you have sent us. They are heads a shoulders about their peers from other schools. I was a scoutmaster for many years so I worked with hundreds of high school kids and yours are so mature and ready for college and the working world. You should be proud of all the work you do." "We are into the third week of the new school year and training has barely got off the ground. Yosman is our Thursday worker and a freshman and ahs been wish us for three days. When he came into the office the morning of August 31st he was informed that he would be covering the front desk and answering the phones by himself. I figured that his response would be fear and trepidation but it was very professional. Sara Riggs, Executive Assistant to the CEO had this to say: "He is fabulous. I listened to a couple of calls (waiting to talk to him) and he did an excellent job." He also helped immensely with putting boxes together for the gala. " 70% of Arrupe Jesuit graduates have either graduated from college or are continuing their college studies today. While completing their college studies and after earning their college degrees, Arrupe Jesuit graduates are filling positions with their former CWSP employers. "Daisy exceeded expectations yesterday at two distinct points that demonstrated to me a considerable depth of knowledge about our OnePoint systems and processes. First, during a period of downtime between tasks, she sought out additional ways that she could contribute using our intercompany to do list. The way this list is organized is pretty complicated and I’ve only shown her how to use it once or twice, with no expectation that she actually regularly engage it but I happened to notice her checking through to see if there were any tasks that she could take on without having to ask me. I’ve seen many new OnePoint employees with significant corporate experience struggle with the concepts of how to “check ops” to see what their responsibilities are but Daisy seemed to have no problem grasping the concept and putting it into action." "Noelia has been a huge help in the accounting department since she came on board she organizes and files over 500 + proformas. Noelia has taken on this task with a smile and continues to do a great job. Noelia has also has learned to hyperlink, download and update court records. Noelia needs very little instruction she is a very fast learner. I am very pleased with all the work she is given and have received many positive comments about her work." "She’s really a hero here. We’ve become so comfortable with her performance here, we have to often step back and understand Karina is a student worker here and not an actual employee. She does so well unsupervised, that we’ve been spoiled by her dedication to and knowledge of our program. We did not hire her during a formal interview process, though her work constantly suggests this very thing. Whether it as our relief receptionist, scanner, data entry clerk or whatever sporadic task she’s assigned, Karina honestly has never, ever let us down the two years she’s been with us." "Alyssa has been ambitious since her very first day interning for the Benefits Team at Chipotle. She has great enthusiasm for every task and is not afraid to ask questions and to learn more. She wants to actually understand the process at hand instead of just completing it to get it out of the way. Alyssa always inquires if there's more she can do to help out and she has a pleasant demeanor while she is here. She also is an incredibly fast learner who is well spoken and organized while at work. Her positive attitude and outlook on life will no doubt lead to a bright future. We are grateful to have her on our team!"